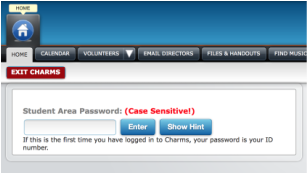 A How-To on Charms Office Assistant! ​The RHS Instrumental Music Program uses CHARMS, a management program for musical ensembles. Mr. Weimer uses it to manage student information, uniform assignments, and financial records. You will want to check here when you have questions about fees paid or fundraising amounts credited. You can also find the necessary forms for participation in the program on CHARMS, as well as on this website on the Forms page. 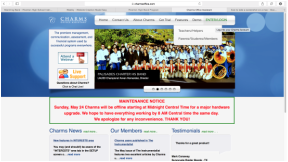 CHARMS is also the program that Mr. Weimer and the Band Boosters use to send out emails, it is important that the parent and student contact information is up-to-date. New students are given log-in information when they turn in registration forms to Mr. Weimer, so talk to your student about updating and adding your contact information, as well as getting the password for your student's account. Click on the link below and follow the steps at the bottom of this page to get signed in! Enter the school code rivertonhsband. No capital letters or spaces. Enter your student password and you will be signed in!